Located on Cork Street, close to Kinsale Garda Station. Kinsale has always been a beacon of great food and hospitality, drawing patrons countrywide and beyond to its streets for the best of what Ireland has to offer – Whether it’s fancy and formal or trendy and casual. Tom Kay’s Supper Club, on Cork Street, is definitely the latter. It’s laid back, funky and informal, and I love it. It’s the perfect place to go for a bite, be it heavy or light, and couple of cocktails with friends, where you can have really high quality food without all the pretension. On my suppertime visit, the menu was made up of an eclectic mix of small and large plates, as is the fashion, with fab dishes like ricotta and parmesan gnudi, finished with sage butter; lobster spring roll with mango, avocado, cashews and a sesame and lime reduction; as well as monkfish tempura with a rice wine pickled slaw and Oriental dipping sauce. The shellfish on offer was really good with Oysterhaven oysters available hot or cold; crab crostini with Atlantic crab and avocado; and half or whole local lobster all making an appearance. That being said, the carnivores are certainly not forgotten at the Supper Club, with braised beef short ribs with sesame crusted sweet potato; tenderloin of pork with fennel and potato rosti; and lamb rump with basil and mint peas all ready to satisfy their meaty cravings. I decided to start with a half dozen oysters, served Rockefeller style with a garlic and herb crumb, which were absolutely cracking, whilst Brendan opted for a beautiful foie gras terrine paired with a fab blackberry and thyme jelly and crostini. Having thoroughly enjoyed our first plates, we set our sights on something a little bigger to follow up. Himself chose the Supper club steak, cooked to a perfect medium as requested, and served with herb mash, asparagus and béarnaise sauce, which he happily devoured, along with a side of twice cooked chips with parmesan and a truffle vinaigrette. I, on the other hand, went for pan-fried John Dory fillets served with braised fennel, Oysterhaven mussels, fondant potato and a saffron and red pepper sauce, which was delightful alongside the occasional stolen chip from across the table. In a mood to treat ourselves, we indulged further with desserts, which included lemon and lime tart; crème caramel; a lemon meringue cocktail; as well as their farmhouse cheeseboard. But, from the moment I saw the menu, I knew it would be the flourless chocolate cake with whipped cream for me. Ace! Brendan was delighted to discover an apple cake served with a whiskey crème Anglaise, which certainly didn’t last for long once it’d arrived. Having finally suppered enough, we happily headed for the hills. 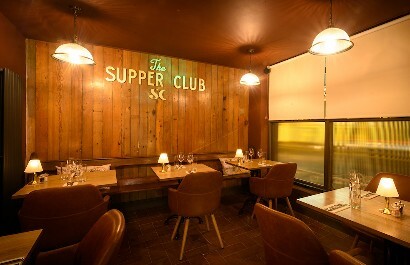 Next time your in town, don’t miss the Supper Club, and sure to check out their fab cocktail menu and al fresco dining area too.